EPA technicians collect a sample of Dimock water in Jan.
Federal health officials are assessing risks related to elevated levels of arsenic, barium, manganese, and methane in an aquifer that supplies homes in a shale gas production zone in Dimock, Pa. The Agency for Toxic Substances and Disease Registry is following up on an EPA study that analyzed the water of 64 homes near drilling operations in the Marcellus Shale in the rural community just south of the border with New York State. After six months of testing, the EPA concluded last month that levels of pollution in five of the wells – roughly 8 percent -- were high enough to pose health risks, but those risks were mitigated by treatment systems installed in or planned for the homes. The EPA investigation was prompted by an ATSDR analysis of previous water tests in December, 2011. The ATSDR, acting on concerns by residents, evaluated records of previous samples collected by both Cabot Oil & Gas and the Pennsylvania Department of Environmental Protection. Officials found evidence of elevated levels of various solvents, metals, and glycols that posed “a possible chronic public health threat based on prolonged use of the water” in “at least some” of the Dimock wells. visited the Dimock homes along Carter Road and State Route 3023 on November 10, 2011 and were provided a large amount of well data. 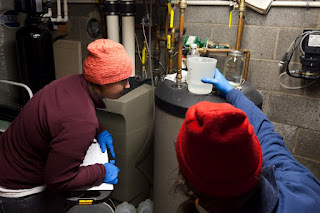 Based on the home visits and preliminary review of data, EPA and ATSDR raised the following concerns: the reliability of methane removal systems; the presence of other contaminants besides methane (metals, volatile organics and non-naturally occurring organics) for which the well treatment systems are not designed or in place to address; and homes/wells in Dimock that may have never been tested and may be contaminated. The multiple sampling efforts at this site to date were conducted by PADEP and private contractors not affiliated with EPA. In response to the concerns, the EPA subsequently tested wells in the area between January and June. In July, the EPA press office issued a release that stated “no further action” was needed by the EPA. But the release failed to mention that the EPA results would be factored into a broader health study by the ATSDR. 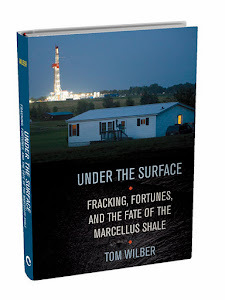 Accordingly, the EPA results were widely characterized by news outlets as resolution to pollution questions that have nagged the small town overlying one of the most lucrative production zones for the Marcellus shale. The ongoing ATSDR investigation and follow-up -- cited in the Record of Activity/Technical Assist – were confirmed by Bernadette Burden, a spokeswoman for the ATSDR. According to Burden, the agency is pursuing “a fairly comprehensive review” of the Dimock water case that takes into account the EPA tests, as well as previous tests by Cabot contractors and the DEP. The ATSDR -- a branch of the Centers of Disease Control and Prevention -- will account for risks of long-term exposures to the water through showering, drinking, bathing and washing, as well as risks that might be compounded when people are exposed to multiple toxicants. There is no time frame for the completion of the report, she said. A full public health evaluation should be conducted on the data from the site area. Because many of these compounds (e.g. metals) affect the same organ systems, ATSDR recommends evaluating the mixture for public health impacts using computational techniques or other suitable methods to evaluate the potential for synergistic actions: The cumulative concentration of all dissolved combustible gases should be considered to protect against the buildup of explosive atmospheres in all wells in the area. The contaminants found by the EPA – arsenic, barium, manganese, and methane -- occur naturally in the ground. They are also associated with drilling operations, which can exacerbate existing problems or introduce new ones. In the five cases where the levels were high, according to the EPA press release, the residents have or will have treatment systems to reduce chemical concentrations to levels acceptable for potable water. Dimock has been the focal point of a national controversy over the impacts and risks associated with shale gas development and high volume hydraulic fracturing. The process, commonly known as fracking, involves injecting bedrock with millions of gallons of chemical solution to stimulate the flow of natural gas. While fracking has often been implicated when things go wrong, the migration of methane and other chemicals in the ground into aquifers can be caused by drilling in the absence of fracking. Barium, one of the problem chemicals found in Dimock, is a common constituent of drilling “mud” – a viscous solution used to lubricate the drill bit and float cuttings to the surface. The Dimock conflict began on January 1, 2009, with the explosion of a well that supplied water to the home of Norma Fiorentino, a plumber’s widow and great grandmother. A subsequent investigation by the Pennsylvania Department of Environmental Projection found that methane was seeping from nearby drilling operations into an aquifer that supplied Norma’s well and others along the Carter Road area. Cabot contested the findings after the DEP, under Governor Ed Rendall’s administration, determined that the aquifer was permanently damaged from methane migrating from the bores of nearby gas wells. The DEP ordered Cabot to build an $11 million water pipeline to supply affected homes. That order was lifted shortly after Tom Corbett won the gubernatorial election in November, 2011. Last month, Cabot reported that it had reached terms for a settlement with 32 of 36 Dimock families that were suing the company for water pollution. Terms of the deal were not disclosed. Not all the plaintiffs accepted the deal, and some are continuing to pursue the case. Note: I asked EPA officials the following question through spokeswoman Terri-A White. White told me to expect a reply soon. I will update this report accordingly. Update: Answers from EPA added below in italics, 5 p.m. September 5. EPA’s sampling of Dimock wells shows hazardous levels of methane in six instances. What steps have been taken to correct this? EPA Response: It should be noted that five of the wells sampled, not six, presented a level of methane above the federal Office of Surface Mining’s screening level of 28 parts per million. In the list of wells you've provided, HW29z is the same well as HW29. At the time of EPA’s sampling, two of these homes were receiving alternate sources of drinking water from Cabot. All of these residents were advised of the methane results and the results were also shared with PADEP and the Susquehanna County Emergency Management Agency. All of these residents were already aware that their water contained levels of methane. Overall, we have found that the homeowners are aware of the existence of methane in their private wells and generally have installed vents to reduce the potential build-up of methane in their wells. Pennsylvania DEP is continuing to address the issue of methane in Dimock wells under a consent order and agreement. EPA Response: Throughout EPA's sampling of residential well water in Dimock, which now has included five separate data releases, EPA has reviewed analytical results, and the particular circumstances at each residence, to make determinations on whether the situations presented a health concern, and if a further EPA action was warranted. The cumulative result from those efforts is a review which has shown that with only a few exceptions we did not find levels of hazardous substances in well water that could present a health concern. In those cases where the levels could present a health concern, we found that the residents have now or will have their own treatment systems that can reduce concentrations of contaminants to acceptable levels at the tap. No further characterization of groundwater is planned by EPA. EPA Response: EPA’s goal was to provide the Dimock community with complete, reliable information about the presence of contaminants in their drinking water and determine whether further action was warranted to protect public health. This sampling and evaluation did not demonstrate situations that present a health concern or give EPA a reason to take further action. Dr. Ron Bishop came to the same conclusion when he wrote a report on the EPA tests. When Big Oil destroys the last accessible fresh water we'll be standing in mile-long lines, fighting amongst ourselves, waiting to receive our rationed water while the plutocrats wine, dine, and party. Great post, Tom. Thanks for clarifying that EPA's was not the "last word" but just part of a long process of analysis. Thank you so much for this clarification of the situation in Dimock. The EPA's press release should certainly have mentioned the ongoing ATSDR study. Perhaps everyone who is concerned about this issue should contact the EPA and ask why the press release did not contain this information. The public funds the EPA and has a right to be kept fully informed of the EPA's investigations of all environmental issues--especially those issues that relate to public health. Re the EPA study: I read through the results when the EPA study came out and I was surprised that there were no levels listed for radium-226 or radium-228. It would appear (?) that the EPA did not test for radium, even though: 1) testing for radium seems to be a fairly standard thing to do (as I recall, radium levels are included in the routine testing done for our municipal water system here in Windsor, NY); and 2) radium is a possible contaminant at drilling sites because it can return to the surface via flowback from the gas well. Perhaps there is a valid reason for this omission--I was wondering if you knew anything about this? Mary, I have passed your question along to Terri-A White of the EPA. She said she will try for an answer by the end of the week. Mary, when you checked the EPA results, you may have noticed that many of us whose water was analyzed had four types of uranium in our water that showed up on the EPA results. When the toxicologist came around, they had no response to our concerns about having uranium in our water, other than to say it is not something that they have a limit on for drinking water. Hi Pat. Yes, I did notice that they did check for uranium. That is one of the reasons I found it odd that they did not check for radium. As I said above, there may be some valid explanation for not including radium in the tests--I am not assuming that something shady is going on. I just think it is completely reasonable to ask the EPA why they did not test for radium-226 and radium-228. It's from the USEPA for maximum contaminant levels (MCLs) for listed analytes such as organic and inorganic chemicals and radionuclides. One thing to note is whether or not the full suite of contaminants were analyzed. Radium 226 and 228 are on the MCL list. So your question is appropriate given the situation. Tom--I'm wondering if you have had any word yet from Terri White on why the EPA did not include radium testing in the Dimock water tests. The action level proposed for this case was 28 mg/l (or 28,000 ug/l) and it looks like the samples you cited for Dimock are above this action level. The USGS was acting as a third party and I'm not sure on who's behalf. Anyway, some more background on methane in groundwater in the Appalachian region. One of these days I'm going to buy your book and after the purchase eventually read it. From the snippet it appears to be an essential read. Thanks for sharing. I find background and context to be important and useful. You are correct: 28 mg/l is the action level that the EPA uses and the values in the cited wells were at or above this. I think you will find the book worthwhile. The technical issues are relayed as backdrop to the human story unfolding from multiple perspectives. It is not all about action levels and analytical results. Just wanted to explain, in case anyone was wondering why I've deleted a comment, that I had initially replied in the wrong place when posting my "thank you" to Tom.